My wife, Sharon, and I began researching her family history a few years ago. Some work had previously been undertaken by other members of her family and reproduced in paper format. Utilising the strength of the internet's near limitless resources we made substantial gains as her vast family revealed itself to us. Sharon's father was a West and her mother a Caws. The latter is a well known name in the district of Nettlestone and Seaview. The naming of Caws Avenue is a more modern nod of deference to the family that once owned much of the land and greatly influenced the development and prosperity of the neighbourhood. In the course of the research we discovered one Stanley Winther Caws, Sharon's third cousin three times removed. His date of death immediately alerted us to the possibility that he was killed in the First World War and what follows below is the story as we unearthed it. This task wasn't undertaken alone and it would be appropriate at this stage to express our thanks and appreciation to a horde of volunteers at the Alberta History Society of Canada and Rose Willis, Arnold van Dyk and K.C. 'Kay' de Villiers of South Africa. On Saturday 22 March 1879 Harriet Caws (nee Handley) was in labour somewhere in the village of Seaview, possibly at home Oscar Cottage in the High Street where her husband Douglas paced in anxious ancitipation of a third child and the possibility of Harriet finally bearing him a son. Four year old Dora and two year old Hilda were horrified by the screams from their mothers room as the family's live-in maid Ada Bartlett tried to calm their fears. The first cries of the new born child entered the world and there Douglas saw his first son and they named him Stanley Winther Caws. Seaview suspension pier, completed two years after Stanley's birth, built by another of the Caws family. Douglas was an agent of estate and a commissioner of oaths. Harriet, seven years his junior, spent her time enjoying ladies leisures and sharing in the care of her children with Ada. They enjoyed an affluent lifestyle in a quiet corner of the Island that was about to explode with popularity for the wealthy and aspirational. Seaview as a village didn't exist until the early 1800's. In the opening decades a two-and-a-quarter field was divided into nine parts of which six were acquired by gentlemen bearing the name Caws. All six of them, like their fathers before them, were skilled and well known pilot boat masters including Robert, who with his wife Elizabeth (nee Goodall) produced several children, in the middle of which emerged Silas born in 1812. He too took the seas and so successful was he that that his wife Emma proudly entered the occupation pilots wife in to the family's census returns and from his profits Silas built Coronation Cottage in 1838. 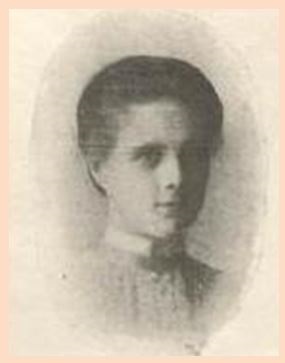 Silas and Emma bore eleven children, eight sons and three daughters, the second eldest of which was Stanley's father Douglas, born on 23 August 1843. Why or how it happened we'll never know but Douglas wasn't to follow his ancestry to the shore and instead at 17 years old he is found lodging at a house in St Mary's Street, Cowes, and earning a living as a grocer's apprentice. Ten years later he reappears back at Oscar Cottage sharing the abode with just two sisters, Emily and Eliza. His career prospects have taken a turn for the better as he was practising as a house and land agent. Two years later on 11 October he married Harriet and as described above Stanley entered their lives six years later. He was followed by two more sisters, Constance and Alison, but remained Douglas's sole son and heir. To describe Stanley's childhood would be mere conjecture. Douglas, so it appears from his choice of profession, did not follow the seafaring adventure spirit of his predecessors. His undertakings suggest he would not have been in a position to inspire the same in his son. However Stanley may have possessed the adventure that skipped a generation in his father. At 22 years old he was missing from the family home when the 1901 Census was held. Diligent research revealed that he appears on page 516 of the Charlton South - Polling District electoral register of lodgers. 32 Wellington Road is his new home where he rented a furnished first floor bedroom and parlour from Mrs E. Smith of the same address. He paid the rent and for his other needs by working as an electrical engineer, a pioneering endeavour of its era. This was the age of Alexander Graham Bell, Thomas Edison and Werner von Siemens, among others, who evolved a scientific curiosity into an essential tool for modern life. London would literally have been buzzing for the power source and Stanley's instincts for an adventure in engineering led him to the centre of its activity. London of the time would have been buzzing for other reasons too. By now the country had been at war with the South African Boers for the second time in twenty years. By 1901 the methods and tactics of conventional warfare employed by the Empire's forces successfully across the globe for many decades, had finally broken the back of the stubborn enemy. It had been a difficult war regardless and hadn't come without considerable and underestimated cost in life and materials of the British Army. This was the first conflict in history of mankind to have been caught in moving images and these, plus a stream of reports, photographs and sketches, even those from correspondents trapped in one of the several sieges, made their way back to the mother country where an eager public hung on every word until the next report. Being in London at this time Stanley would have been as well informed of the course of the war as any member of society nationwide. When Pretoria fell to the Army in June 1900 he, and all others, were assured that eventual victory was just days away. It didn't happen as the wily Boers, recognising their own weakness on the conventional battlefield, turned to strategies of the guerilla; ambush, interdiction and speed! A commando of Boers on Spion Kop, Natal, an unlikely but convincing opposition for a Victorian British military unused to battlefield setbacks. Over a hundred years before, 1794, when the Government of the day feared invasion by the French Revolutionary army, Prime Minister William Pitt the Younger, passed a bill that invited Lords Lieutenant of counties to raise volunteer cavalry units. The Yeoman of that were recruited on clear lines of class delineation; they weren't gentlemen but they were a cut above the rest being country men who farmed the land as freeholders and in some cases as tenant farmers. The capacity for the Lords to raise these units for home defence only remained in place but in 1899, following the Black Week of the Boer War in which British troops were shockingly defeated in multiple battles. The Government needed to raise more troops and to combat the speed across the battlefield of the mounted Boer sharpshooters, they needed to be cavalry and the Yeomanry fitted the bill. A revised set of rules allowed the Imperial Yeomany to be sent overseas in service of the Crown. A total reorganisation followed in which new units and sub-units were formed comprising new recruits alongside those that remained of the old yeomanry's. Most significant was the discarding of swords for rifles as the Imperial Yeomanry were to lose their cavalry status and operate as mounted infantry. 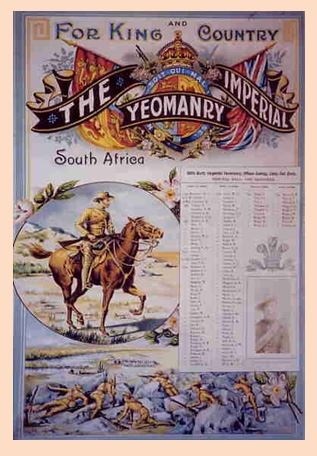 The first contingent of the Imperial Yeomany departed in steady ships between January and April 1900 but the stubborness and refusal to be defeated of the Boers compelled a second recruiting sweep in 1901. George Thomas Cavendish Paget was the son of a British general and a compulsive self-styled amateur soldier and adventurer. Whilst never serving as a regular soldier he had seen action in the Russo-Turkish War of 1877-78, the Zulu War of 1879 and the Greco-Turkish War of 1897. Above; George Thomas Cavendish Paget and to the left a colonial pattern sun helmet worn by his troopers. Paget began recruiting around the clubs of London for his eponymously titled Paget's Horse soon after New Year 1900. His target was to create four companies, 51st, 52nd, 68th and 73rd, that would comprise the 19th Battalion, Imperial Yeomanry. Paget's Horse deployed to South Africa in a steady stream between January and April 1900 and were soon to see action. By 1901 a second round of recruitment was required to fill the ranks of the larger New Yeomanry. Where, when and how Stanley became aware of the call to arms of the Yeomanry we shall never know, but it appealed to his spirit of adventure and on 23 January 1901 at an unknown address in London's Carlton Street, Stanley signed a short service attestation of one years service to the 68th Paget's Horse. Army Form B.111 confirms all that we know of Stanley so far and ascribes him the service number 20347 (other documentation states that he later served with the 106th (Staffordshire) Company of the 4th Battalion). Listed close to Stanley in one of the many rolls that survive is one Fernand Charles Butler of Frome in Somerset, the pair were set to become best friends. The Isle of Wight County Press of 9 March 1901 makes reference to Stanley's departure for South Africa. No direct reference to Stanley's exploits can be located for his period in South Africa. However the discovery of another man's memoir allows us to gain an impression of the life of the Yeomanry's troopers on the veldt. With Paget's Horse to the Front, by Cosmo Rose-Innes was published shortly after his service ended with recollections fresh in the mind. I have since scoured the country in search for a copy but those few that have surfaced at various auction houses have sold for substantial figures. By the providence of a kindly supplied electronically scanned copy I have been able to provide a facsimile version which is now available in paper and hardback forms from the IWFBF (see the IWFBF Publications page). Of additional interest is that Rose-Innes makes reference in his memoirs to the Imperial Yeomany Hospital at Deelfontein where at the same time Sandown fireman (and later Chief Officer) Wilfred Harry Brown was serving (see Fireman of the Karoo). Left; some of the Troopers of Paget's Horse, and on the right a group of PH officers. Stanley returned from South Africa on 18 August 1902 bearing the scars of a wound on the rear of his right shoulder, two marks caused by wounding on his left arm and both forearms heavily tattooed. With the foresight of Stanley's life to come, one asks what would become of an adventurer with a rebellious spirit once the war is over. To return to the dismal rented rooms in Charlton and an occupation of electrical engineering may have appalled Stanley after the freedom of galloping across the veldt armed and ready to fight. Where life took Stanley for the next few years isn't known but for several years beginning in 1905 he is listed in the passenger manifests of several vessels crossing the Atlantic in both directions between England and Canada. In several of them Stanley is joined by Fernand Charles Butler, his friend and fellow trooper of the 68th. In the same year, and probably without coincidence, the Legion of Frontiersmen was formed in London. The Frontiersmen were formed by Roger Pocock, a man of no notable ancestry who possessed an adventurers spirit in abundance, if not morals. Before the turn of the century he had partaken in many adventures after emigrating to Canada as a child with his family. His father had taken the Holy Orders and was set on converting the savages of the north to Christianity. When old enough Roger also undertook missionary work but the church objected to his notorious philandering and disengaged his service. In 1898 he led a failed expedition to run horses to the Klondyke and while there the finger of suspicion pointed at him for the murder and robbery of Sir Arthur Curtis whose body was never found. A short while later he left Macleod in Canada and rode solo all the way to Mexico City along what is known as the Outlaw's Trail. This was followed by service in the Second Boer War with what was described as one of the most irregular bands of Scouts. A return to Canada saw service he relished with the North West Mounted Police until 1904 when the Illustrated Mail paid him to go to Russia and report on the events of the Russo-Japanese War. On his return the despatches he'd sent and other information he'd obtained proved of great interest to Prince Louis of Battenberg, Director of Naval Intelligence. In the following year, buoyed by the success of his Russian encounter and the reception from intelligence circles at home, he formed the Legion of Frontiersmen. 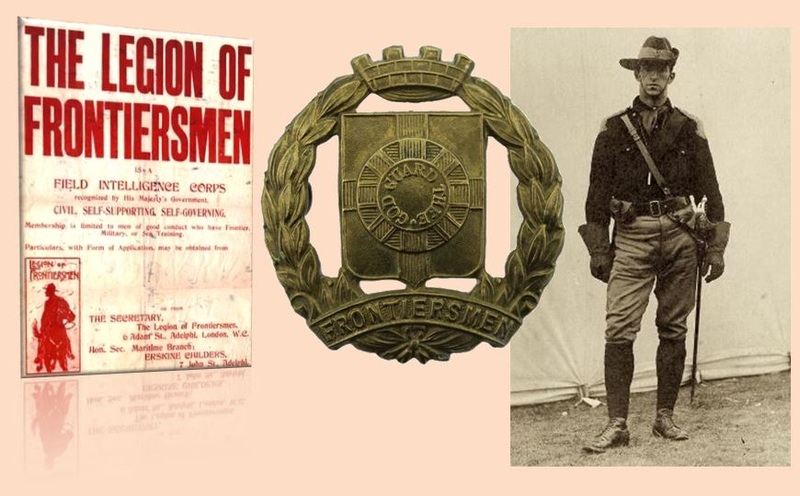 Below, left; LoF recruiting poster (circa 1905), middle; one example of an LoF cap badge, right; typical frontiersman of the period. Between 1905 and the beginning of the First World War, Stanley made several transatlantic crossings, often from Liverpool to ports of Nova Scotia. It was clear that he'd identified the sprawling mass of rugged opportunity of Canada beckoning his pioneering spirit. Extracts from an Alberta history journal produced in the 1950's refer directly to Stanley and his companion Ferdnand Charles Butler. After the Boer war 1899-1902, numbers of Englishmen who had taken part in the campaign came out to Canada, and our Municipality received her share of Boer War Veterans. A club was formed by the young men around Lac Ste. Anne – homesteaders, as well as packers, surveyors and freighters. They called themselves the “Legion of Frontiersmen” and met together for good fellowship. On occasion they came as far as Caws’ shack at Stanger for a meeting. They built a hall at Lac Ste. Anne as a club room and for parties and dances. Several other references expand on this and claim that Stanley was the first Commandant of the Alberta branch of the Legion of Frontiersmen. One includes the following revealing extract; This early-era commandant, was recorded as Caws, Cawes, and Caus. He was a tattooed Boer War veteran and “remittance-man” (often the “black sheep” paid by the family to stay out of England) who formed the first Legion of Frontiersmen unit in Alberta. The 23 May 1907 edition of the Edmonton Bulletin made reference to Stanley and Fernand that gives an insight to their lives; Messrs. Caws and Butler, who have been land seeking around Lac Ste. Anne, arrived here Sunday evening and stated that while camping near Jack Fish Lake, 17 miles further west, the horses attracted their attention by their startled antics. On going to see the cause they found a big she bear standing about six feet high and three cubs with her. A volley of shouts instead of shots was heard. As hard luck would have it neither possessed a gun. The whole outfit made tracks for the bush, twigs and sticks flying in all directions. If it is to be believed that Stanley and Fernand had indeed claimed squatters rights on land in Stanger and erected structures there by 1907, the news of 1908 would have been music to the ears of both men. Under the Volunteer Bounty Act of 1908, veterans of the South African War were entitled to 320 acres of Dominion Land. 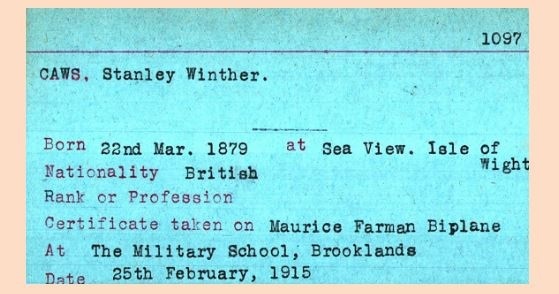 Stanley made his application to the Secretary of the Militia Department in Ottawa on 16 February 1908. Stanley's signature on the Application for Volunteer Bounty of 1908. Lac Ste. Anne, previously known as Wakamne (God's Lake) by the Nakota Sioux and Manitou Sakhahigan (Lake of the Spirit) by the Cree nations. His application was successful. Later the same year, for undefined reasons but probably in connection with the expanding aspirations of Roger Pocock and the Legion of Frontiersmen, Stanley returned to England. He didn't dwell for long and the passenger manifest for his return voyage suggest he is now a naturalised Canadian as he is listed as Returning Canadian and that he works as a cattle rancher in Stanger. By now some controversy existed between Stanley and two commandants of LoF units in other states over who was the first in Canada. Evidence seems to indicate that it wasn't Stanley. This does nothing to minimise his role in Lac Ste. Anne where he epitomised the work-hard play-hard maxim to the full; bawdy behaviour coupled to determined pioneering formed his normal day. I stayed in that neighbourhood about three years. The last year I was there was a very dry year. In the late fall a fire swept the country. That same fire burned and kept eating away at the top soil during the winter. The soil on my homestead was completely ruined and by writing to the Department I was allowed to file on another quarter located in the place that some years later was called Stanger. While I was still staying at Barker's I often met Caws and Butler, our nearest neighbours for a long time. When I changed locality they persuaded me to settle near them. Those first years in Stanger were hard ones, money was scarce and the art to make a lot out of a little was not acquired yet. In 1908 Oswald Norman, Tom Geurrier, and Mr Mallandaine came together to the Stanger district. A young man, Strickland by name, and a friend of Stanley Caws, also came at the same time. Young Strickland met a sad fate. He was a fine young man but had never roughed it. It was remembered by some of his acquaintances that when he left England one of his aunts gave him a hot water bottle for a farewell gift. He stayed a lot with both Caws and Norman in their shacks and they were kind and friendly to him, but he was very independent and didn't like people giving him his keep. Stanley Caws devised a scheme - he got old Mr Butler to have Strickland do chores for him and Caws paid Butler his 'board bill'. But Caws told Butler on no account to ever let Strickland know about the board being paid; to let the young man think he was earning his board. However, one day in a huff the old man stupidly let it out, and that was when Strickland disappeared. He left a note to Norman leaving him his few belongings. They searched for several weeks and finally found what was left of him with a phial beside him. He had taken poison. It was a tragic affair. The Land Grant Chart of the Lac Ste. Anne district. 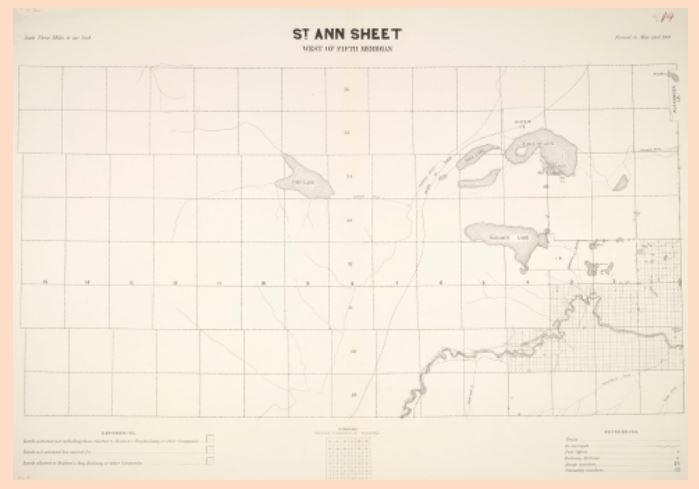 Each of the large grid squares is further divided into 36 land plots of which Stanley owned six by 1910. No scale is applied to the chart but it is known that the lake itself (Lac Ste. Anne - top right) had a surface area of 21 square miles. 1908 also saw the formation of the 19th Alberta Rifles on 1 February. Some historical texts suggest the formation was driven by the Legion of Frontiersmen. Other sources pay no heed to this but agree on the units emergence and that in 1911 it was redesignated the 19th Alberta Dragoons. Stanley was among them and by 1914 was serving as a sergeant with this mounted militia. From 1908 until the War, Stanley flourished in his six plots of Alberta land. At times various he is remembered as a mounted policeman, a corporal of the Frontiersmen and Senior Non Commissioned Officer of the Dragoons in addition to his developing business interests. 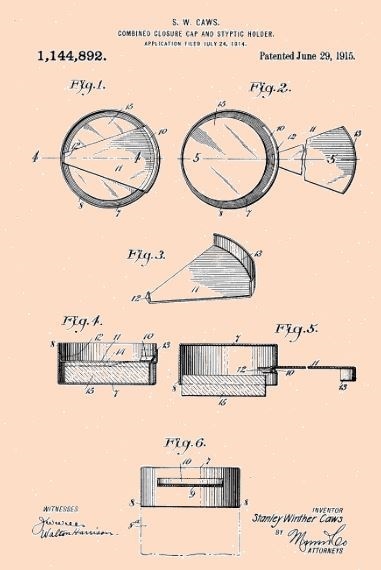 His talents weren't to be assuaged as he turned them to more domestic matters and shortly before the War submitted a patent in the United States along with the sketches seen on the right for a gentlemen's Combined Closure Cap and Styptic Holder. Whether or not these were a commercial success is unproven but it evidences Stanley's diverse talent and opportunism. They must have impressed somebody as the creation featured in a 1915 edition of the Scientific American. Back home on the Isle of Wight Stanley's elder sister by three years, Hilda Beatrice, was displaying equally pioneering endeavours in her own right. While Stanley was struggling in log cabins to establish his living in Canada, Hilda was already breaking the mould by passing both the minor and later the major examinations in Pharmaceutical Chemistry. For a woman to achieve this prior to the War was ground-breaking. In 1912 when she was among those who strove to advance female professionals by establishing the Association of Women Pharmacists the earth of the male dominated establishment must have shook to its core. She was appointed its first treasurer and fulfilled the role for several years. At some point either Fernand Charles Butler met her in England or she perhaps travelled to Canada and met him through visiting her brother. However, wherever and whenever it occurred a spark was ignited between Fernand and Hilda and they were married in Calgary in 1919. Hilda remained a Canadian resident and pioneering pharmacist until returning to England following Fernand's death aged 52 in 1934. When the clouds of war gathered over Europe in 1914, Fernand was also serving with the 19th Alberta Dragoons as a Corporal. On 4 August Britain declared war on Germany. A bill was passed for the formation of the Canadian Expeditionary Force within days, but not enforced until call-ups began in January of the following year. Stanley and Fernand didn't wait to be conscripted. The Dragoons were mobilised, initially for home defence only, on 6 August. Soon after the unit was embedded in the 1st Divisional Cavalry and readied for the crossing to England. Before that could happen Stanley and Fernand departed their homesteads and formed up at Valcartier, Quebec on 23 September 1914 where they made attestations to the CEF. Stanley's documents detail him as an unmarried prospector who didn't consent to innoculations. He stood just over 5'11" tall, with a fair complexion, hazel eyes and brown hair. He claimed to be a Christian Scientist. Special Service Squadron of the 19th Alberta Dragoons, 1914. 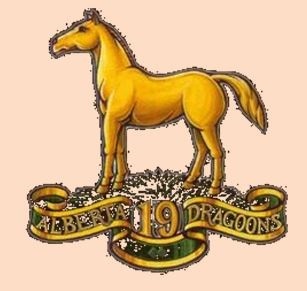 19th Alberta Dragoons crossed the Atlantic in early October 1914. 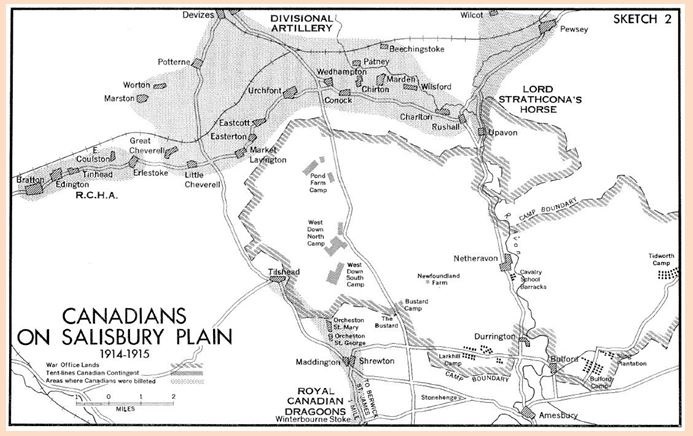 The armada encountered issues along the way not least of all the unplanned and protracted disembarkation at Plymouth due to U-boat activity around the Isle of Wight and Portsmouth, but eventually encamped on Salisbury Plain which was rapidly filling with the streams of troops that formed the Canadian Expeditionary Force. That winter on the Plain is noted to have been particularly miserable. Rain fell most days and the densely populated land, most of whom were under canvas, proved a despairing and disconsolate trial for those even used to the rigours of life on the Canadian frontier. Many fell ill while officers and senior NCO's attempted to drill the men for the imminent deployment to France. It is hardly surprising therefore that some looked for alternatives of which there were few, but Stanley Winther Caws had the capacity to seek out the best of opportunities. 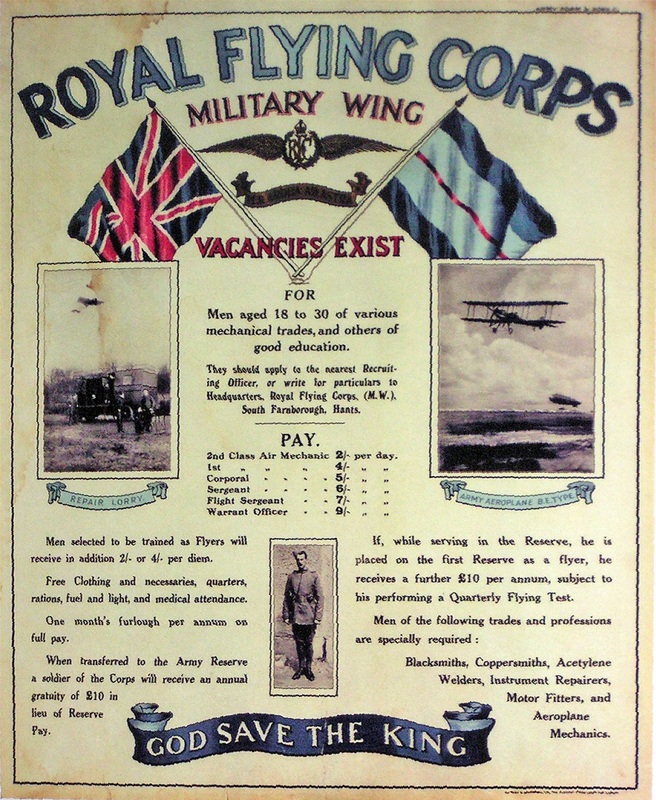 Recruitment poster of the Royal Flying Corps. French General and military theorist Ferdinand Foch once stated aviation is a good sport, but for the army it is useless. How those words must haunt his grave. The Royal Flying Corps was a little over two years old when the European hostilities began. At some point Stanley became aware of the fledgling units existence and was quick to seize the opportunity to become one of the world's first military pilots. The London Gazette of 26 March 1915 reported that Stanley, who'd just turned 36, had been appointed a Second Lieutenant (on probation) with the Corps. Prior to that he'd been struck off the strength of the Dragoons and attended Brooklands where he'd been granted his aviators certificate on 25 February (see below). Having achieved his wings Stanley spent a futher period in flight and combat training until he was appointed to 10th Squadron, 1st Wing RFC on 7 May. 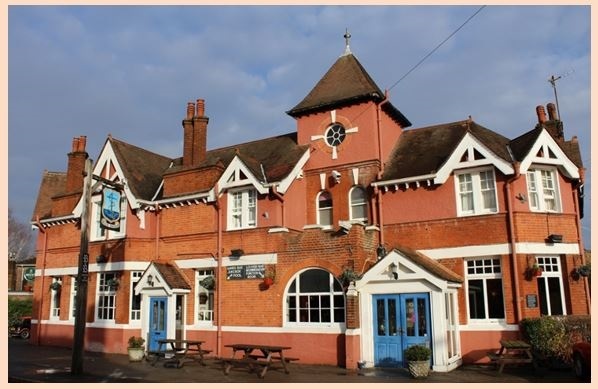 During some of this period he was billeted at the Blue Anchor public house in Byfleet. He was substantially the eldest of the inexperienced pilots. First hand-accounts of his off duty behaviour, including the throwing of knives into the door of the ad-hoc mess while waiting for the waiter to serve dinner, convinced a thoroughbred English officer that Stanley was a typical North American. What seeps persistently through the various descriptions of Stanley's mannerisms and japes is that those around him admired him enormously and whilst on an equal with those recruited he naturally adopted a leadership role among them. The Blue Anchor, Byfleet, largely unchanged externally today. Stanley was one of those who flew his BE2c across the channel on 23 July. The ground support elements had a less distinguished journey as air mechanic Ira Jones recollected; It took us three days to get from Havre to our base at Choques, near Bethune. We rumbled in lorries over the interminable, straight French roads. Through the lines of poplars in full leaf we could stare at fields apparently untouched by war. We seemed to be getting nowhere. Then, in the afternoon of July 25, somebody said: "There's the aerodrome!" Eagerly we looked over the side of the lorry. On the left of the road was a bare black patch of cinders, about 300 yards square, fringed by three canvas hangers. There was not a plane in sight, nor a figure moving. Even in the bright sunshine, the place looked forlorn and deserted. Over a bank of trees behind the aerodrome shone the white turrets of an ancient chateau - the first I had seen outside picture books. This, I discovered later, was to be Squadron H.Q. and officers' mess. The lorries rolled on past the aerodrome, turned right down a narrow lane and came to rest in the yard of a tumbledown farm. The farmer, his wife and their pretty, sixteen year-old daughter waved and cheered from the door of the house as we pulled in. The daughter's greetings were returned with particular fervour. "I had visions of a nice quiet bed in a room under that lichened overhanging red roof. Instead, we were marched off in flights to the different outbuildings. My billet that night was a palliasse on the floor above the cow byres. It was clean enough, but somewhat strongly scented. Dumping our kit, we got busy immediately on the job of going into occupation. The aircraft flew in from another aerodrome within a couple of hours of our arrival. By nightfall, 10 Squadron was operational. 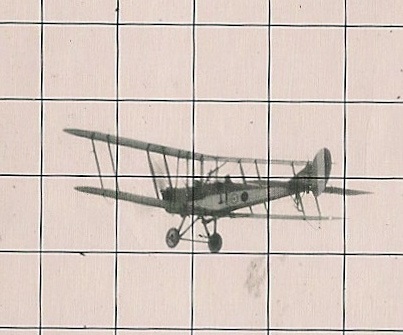 RFC BE2c of the type flown by Stanley, shown through the crude graticule of an early anti-aircraft gun. 10th Squadron's role was that of observers, spotting for the Royal Artillery guns. The officers mess at Choques, now derelict. On the right a group photo of 10th Squadron with Stanley third from left. On 21 September 1915 Stanley, as pilot, lifted from the aerodrome with Lieut. Sugden-Wilson behind him as observer. They were last seen in the BE2c ascending over enemy lines. Their estimated return time came and passed. The squadron waited, expecting to see the exuberant Caulkhead-Canadian shoot over the horizon bursting with more tales of derring-do. Time passed slowly away and as the sun sank in the sky all accepted the aircraft was lost. 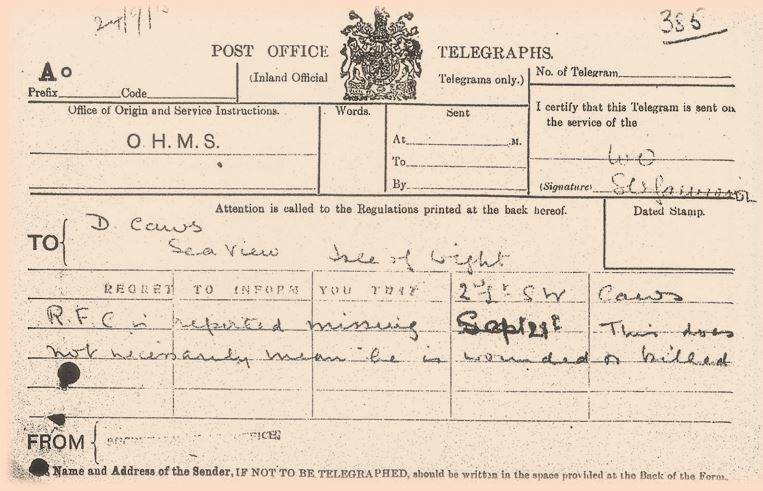 Three days later Stanley's father Douglas received the following telegram (below). 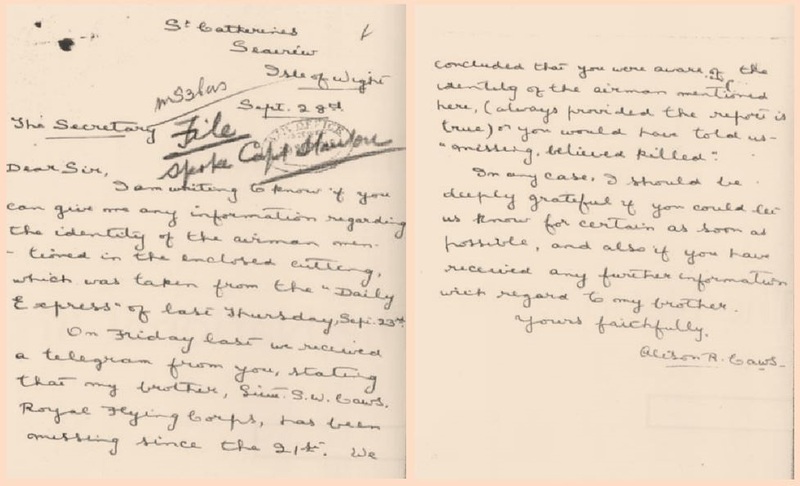 For many weeks letters and replies were sent and received between Stanley's family, written by both Douglas and his sister Alison, the family of Lieut. Sugden-Wilson and the military authorities. What the military kept to themselves in the early days was the following communique dated 23 September (below). On the same day news without mentioning names, was published by the Daily Express, as stated in Alison's desperate letter to the military (shown below). The family waited anxiously for news of their untamed son which didn't come until Lieut. Sugden-Wilson, by now a prisoner of war, wrote a letter received by his parents on 15 October. When we were 11,000 ft. up we were attacked by two hostile machines. Lieut. 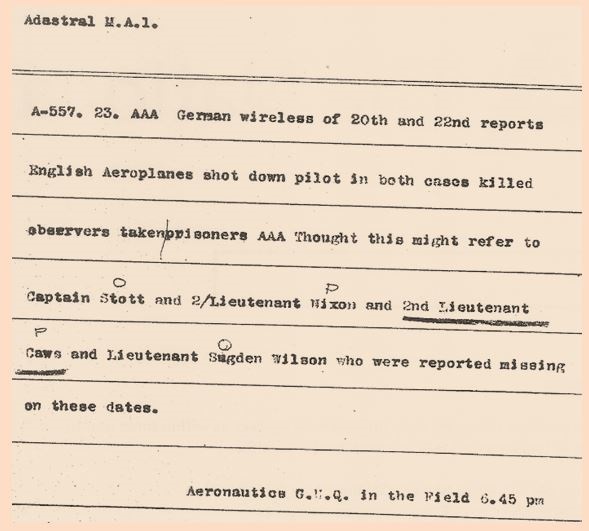 Caws, who was the pilot, was shot dead; the bullet passed through his neck downwards to his heart, passing through the instrument board and hitting my leg. I went on fighting till I had no more ammunition left, but by this time the aeroplane was in a spinning nose dive. I had to get the machine under control before we hit the ground. The machine at once caught fire, and before I got out of the wreckage my boot was burning fiercely. I was able to get it off quickly, but not before my leg was slightly burned. I then tried to lift the dead pilot out, but he was too heavy, both his legs having been broken in the fall. My face was burned a little when I tried to get him out, but my right leg was useless, and I could not stand any longer, so it was no good. The remains of Lieut. Caws were buried by the Germans with military honours, and they were very kind to me, and looked after me well. We had a great fight lasting fifteen minutes. My back and legs are progressing as well as can be expected. Up to the present I have been in four different hospitals, and am as cheerful as my position permits. Stanley had become the third victim of Max Immelmann who was soon to become a legend of the German's who entitled him the Eagle of Lille. Story continued in To The Stars Pt 2.